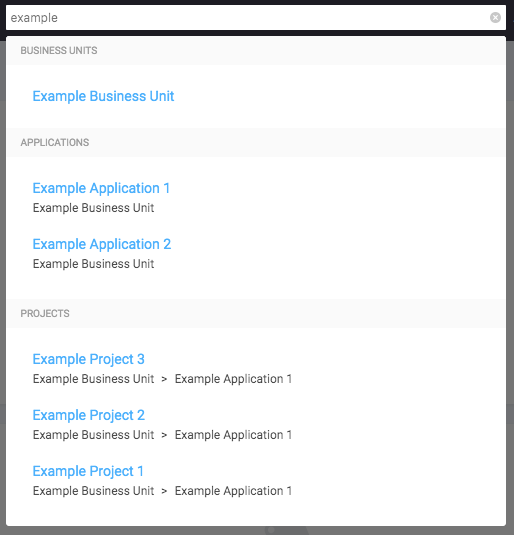 SD Elements provides a way to quickly search for business units, applications, and projects. Select the search field at the top-right of every page. Enter your search query, for instance the name of an application or project. Choose from the list of results displayed, and you’ll be taken to the corresponding page. If there are no results matching your query, a message will be displayed to indicate this. Matching results are grouped by type so that you can quickly find the type you want. Results are ordered with the most recently updated first. When applicable, each result will include a series of links displaying its hierarchy. For instance a project will include its business unit and application. You may not have permission to view the item you’re looking for. The application or project is archived. The search terms are misspelled. Too many search terms may have been entered. The search terms consist of partial words. Entering whole terms or words will result in better matches. The search terms may not be supported. For a list of supported fields, (see Searchable Fields).